Access : 55 kms from Anna Int’l Airport & Kamaraj Domestic Airport. *Jan 2009 will see the addition of 72 more luxuriously appointed cottages and villas located around a meandering pool of 27000 sq.ft. and water bodies. *The above rates are inclusive of complimentary Breakfast. Cuisine : THE WHARF: Sea side specialty restaurant with a perfect blend of outstanding food and breath taking views. Specializes in grills and pastas. Interactive kitchen. A great “Celebration” Place. SANTA MARIA: 24 hours multi-cuisine restaurant with a magnificent view of the extensive lawns, the shore temple and infinity swimming pool Extensive buffet spread for breakfast, lunch, dinner and a la carte menu. MARITIME TALES: The bar to keep the spirits soaring. Open 11:00 am - 11:00 pm. Other Facilities : 24 hrs Running Hot and Cold Water, Refrigerator, Colour TV, Satellite Transmission, Internet Connectivity, Safe Deposit Lockers, Laundry, Foreign Exchange, Travel Desk and Doctor-on-Call. 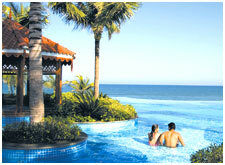 Infinity Swimming Pool, Beach Volleyball, Indoor Games, Kids Play Area, All Terrain Vehicle, Golf Chipping and Putting Green. AYUSH: Ayurvedic therapeutic centre. Open 9:00 am - 6:00 pm. PRANAYAM: Fully equipped cardio-fitness centre and gymnasium. Open 7:00 am - 7:00 pm. 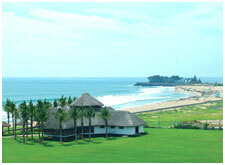 Conference & Banquet Facilites : Extensive lawns ideal for large open air parties and get togeathers. Beachfront barbeques. *A 10,000 sq. ft. pillar less conference hall will open on Jan 2009. 3 fully air-conditioned halls to seat upto 200 persons.